A financial power of attorney creates a legal relationship between the principal and agent enabling the agent to perform various financial transactions for the principal. These can include withdrawing money from the principal’s bank account, buying and selling property in the principal’s name, or managing the principal’s stocks. People choose to enable someone else to do these tasks often because they lack the time to do them or perhaps because they are going on vacation and will not be able to. Disability can also stop people from conducting business transactions. Choosing an agent who is trustworthy and understands your wishes is crucial because a morally questionable agent could have the authority to divest you of a large portion of your property for the agent’s benefit. It is best to choose someone in whom you have complete trust. 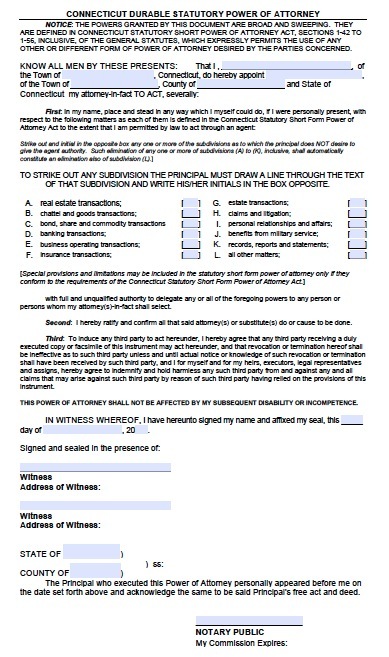 The Connecticut state-issued power of attorney form lists a number of financial transactions the principal may authorize merely by completing the form, like real estate transactions and business operating transactions, and completing the associated formalities. This is known as a general power of attorney, because it authorizes the agent to conduct almost any transaction the principal can. Alternatively, the principal can limit the agent’s power by crossing out certain types of transactions.